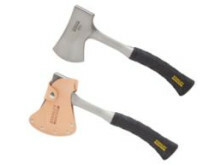 STANLEY® introduces its new FATMAX® Camper’s Axe with a hatchet style handle and ergonomic slip resistant grip. The STANLEY® FATMAX® Camper’s Axe is a scale down from large heavy axes that require more strength and muscle. Campers and DIYers can enjoy this axe as it provides optimal balance which aids in reducing fatigue and exhaustion.